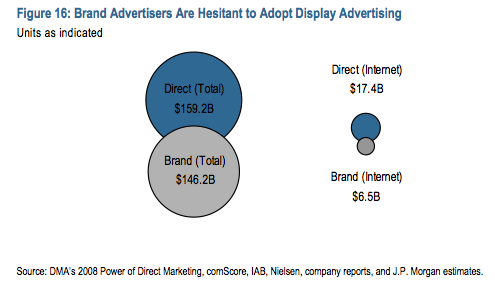 In the advertising industry overall, revenues generated by direct and brand advertising are roughly split 50/50. But in the online world, where direct advertising is represented mostly by search and email ads and brand advertising by graphical display ads, the split is closer to 70/30 in favor of direct ads. Last year, with the economy down, the display portion of the U.S. online advertising industry had a particularly rough time. Total revenues in 2009 were down 5.2 percent to $7.5 billion, estimates JPMorgan analyst Imran Khan in a new Internet industry report. But he forecasts that in 2010 U.S. display advertising will rebound 10.5 percent to $8.3 billion, buoyed by a rising economy and actions to reduce the glut of display ad inventory for higher quality sites and content. For instance, both AOL and CBS are making moves to remove their premium ad inventory from ad networks where prices get beaten down to the lowest common denominator. As the industry moves away from plain-vanilla CPM ads—which lead to banner blindness—and towards a variety of better-performing ad formats (including sponsorships, behavioral targeting, and more timely display ads), that should help lift revenues as well. Khan expects U.S. search advertising to grow an even brisker 13.2 percent pace in 2010 to $16.6 billion, after virtually flat 0.8 percent growth in 2009. To get a sense of the disparity in the economics between display and search advertising look at JPMorgan’s estimates of display RPM (revenue per 1,000 impressions) and search RPS (revenue per 1,000 searches). The average display RPM is forecast to be $1.92 this year, while the average RPS is forecast to be $70.14. Which side of that equation would you rather be on? Which has the most upside? In mobile advertising, both display and search are puny compared to text messaging ads. Total U.S. mobile advertising for 2009 is estimated at $2.6 billion, up 62 percent. But $2.3 billion of that was from text messaging. Only 178 million was mobile search, and $140 million was display (both up 80 percent last year). In 2010, mobile advertising is forecast to grow 45 percent to $3.8 billion, with the breakdown being $3.2 billion SMS advertising, $253 million mobile display, and $321 million mobile search. One of the biggest reasons to be hopeful about the outlook for the continued growth of the Internet advertising industry is that when you look at the time U.S. consumers spend on the Internet versus the amount of ad dollars which go there, the proportions are out of whack. As recently as 2008, U.S. consumers spent 38 percent of their media consumption time on the Internet (29 percent if you exclude teens and young adults), but it attracted only 8 percent of advertising dollars. 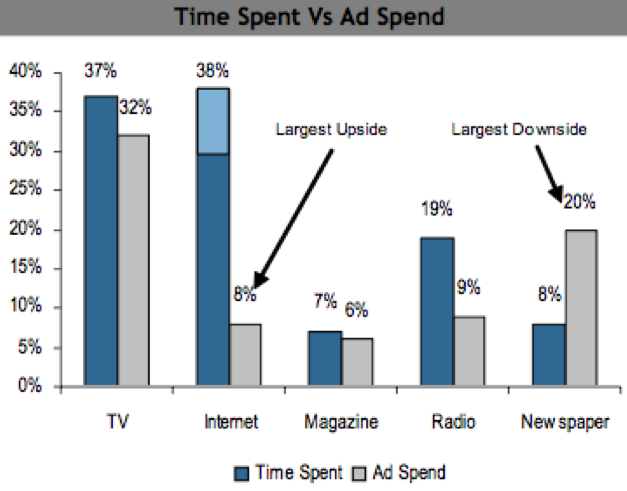 Whereas consumers spent 37 percent of their media consumption time on TV, which captured 32 percent of advertising dollars. If you believe that time is money, advertising dollars should continue to flow towards the Internet.